So who is this Lucas Paqueta that’s getting so much attention in the transfer market all of a sudden? In recent weeks there’s been growing talk of the exciting young attacking midfielder possibly making a move to Manchester United or other major clubs around Europe. 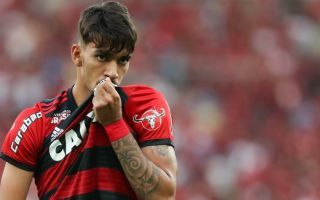 The latest big thing to come out of Brazilian football, Paqueta looks like having a big future in the game and it might not be too long before we’re seeing a lot more of him, perhaps here in the Premier League. He’s a 21-year-old Brazilian attacking midfielder or forward currently playing for Flamengo, where he’s been his entire career so far, having joined their youth team back in 2007. He first broke into the senior side in 2016 and has become a key player ever since, scoring 14 goals in 80 appearances for the club in total now. Paqueta has also picked up his first two caps for the senior Brazil national team. According to WhoScored, he’s very strong in the air, and also a good dribbler, passer, long-range shooter and a hard worker defensively. His finishing has been described as a weakness, while he also tends to foul a lot, suggesting perhaps that for all his effort at tracking back, he’s actually not that great at it. This video below gives an exciting insight into the youngster, who is a real show-boater like Brazilian superstar Neymar, whilst also dropping into the kind of positions Kaka used to excel in at his peak. In other words, he’s a pretty perfect blend of skilful and intelligent, only using his tricks when it helps him gain a genuine advantage on the pitch, as opposed to just for the sake of it. Which clubs are in for him and how much would he cost? According to Sport, as translated by the Metro, Manchester United are currently at the front of the queue for Paqueta, ahead of big names like Liverpool, Barcelona and Paris Saint-Germain. The South American starlet is said to have been the subject of a £36million bid from United, while Marca have also previously been among the sources to report he has a release clause worth £45m. It remains to be seen if Flamengo will sell for anything less than that clause, but either way he could prove to be a bit of a bargain if he lives up to his obvious potential and winds up at the right club and playing under the right manager for him. If you want our opinion, Liverpool seems a great potential move for him given the playing style and Jurgen Klopp’s track record of improving young players, which is in pretty stark contrast to Jose Mourinho at Manchester United. Still, if he could shine for the Red Devils he’d also be an ideal upgrade on the likes of Alexis Sanchez, Anthony Martial and Marcus Rashford, who’ve all struggled to hit top form at the club.